Art Inspiration | New Creation Inc.
Now that everyone is excited for summer time, we here at New Creation have already started looking ahead at the seasons to come. As if designing kids’ clothes wasn’t fun enough already, we’ve decided to focus on some the most exciting emerging trends for girls, just because we love them! As the seasons transition from summer to fall and then onto winter, we will continue to see blush and neutral tones dominate the market. Traditionally feminine fabrics like tulle and lace will be paired with more contemporary textures like leather, metallics, and satin. Playful, illustrative prints will continue throughout the year complimented by animal prints and crochet embellishments that have been poplar for the past couple of years. Some new, heavier textures in the colder months like faux fur allude to an emerging vintage vibe that we totally love. I mean, who doesn’t love a tutu, some fur, and a bomber jacket? It’s time to go all out on your textures. Note: New Creation does not own any of the above images. They are being used as an example to show color and general trend forecasting. Image sources are listed below. 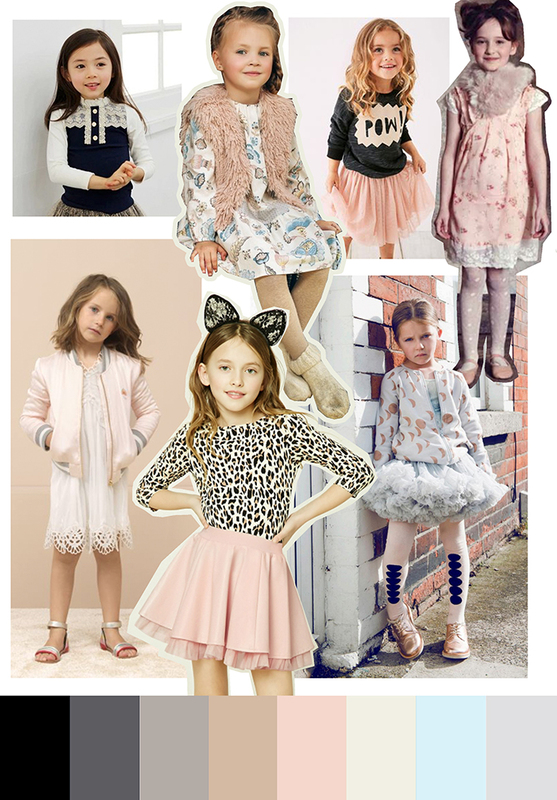 From the upper left going clockwise: Trilooker Girls Long Sleeve Lace Turtleneck, Girls outfit from YUME 2015/16 fall-winter collection, Girls Pink Tutu Skirt and Black Pow Sweatshirt from Next Australia, Vintage Kidswear from Their Nibs Fall-winter 2017 Lookbook, Girls Outfit from MonkeyMcCoy.co.uk, Girls Faux Leather Skirt and Cheetah print Shirt from Forever21, Bomber and Dress from Chloe kids AW 2016 collection.